Even the greatest believers in the theory of evolution prefer to change the subject when you speak to them about mankind’s amazing ability to convey ideas and thoughts through speech. According to the theory of evolution, we should be seeing the beginnings of verbal communication among monkeys once they decide to evolve from their primitive monkey state and turn into a more developed creature, like man. Unfortunately for the evolutionary advocates (and unfortunately for monkeys too), all studies performed on chimpanzee speech haven’t found even an iota of what could be termed language. True, it was discovered that animals use symbols (for instance, the bees’ dance to indicate where there is pollen) but there is no connection between this and language. We can compare it to a person whose face is furious. We understand that he is angry, his face expression shows he is angry, and even a baby who doesn’t know how to say one word realizes he is angry. But it has nothing in common with language. “Natural reasons caused men to separate into different groups — and as a result, languages became distinct. However, the languages were not completely foreign. The language was one but there were different dialects… Safah can mean a lip (concretely) or language (more abstractly). Similarly, lashon can mean the tongue (concretely) or a “dialect” (abstractly). The lips are the border of the inner mouth cavity. It closes the body cavity and represents the entire mouth cavity. The lashon (tongue) is the organ that crafts sound; more abstractly, it means the dialects of a language. It’s still the same language even if it has various dialects. Don’t forget that almost 400 years had passed from the Flood to the Generation of the Dispersal. During this period, people had naturally formed their own groups with the result that there were many dialects. Nevertheless, they all spoke one language. According to Rav Hirsch’s commentary, “same words” means that they had uniform grammar. As we will see later when the Babylonian Tower was destroyed and mankind was dispersed throughout the world, immense changes occurred and languages were no longer recognizable. 1. The fact that the ability to speak is inherent to man. 2. Originally, language was uniform — which can be seen in all languages in the world. One of the greatest language researchers in the world — Noam Chomsky — concludes in his book “Grammar Structure” that human language is in fact man’s most distinct cultural behavior which is as innate to him as an instinct. Because of his genes, man is equipped with the special ability to learn a language. It is most surprising that there are basic similarities between all the languages which testify to a universal human grammar which includes past, present and future, and single and plural. Everyone knows how to apply this grammar, even though they are not even aware of their ability. A vocabulary cannot be inborn, otherwise everyone would speak the same language. However, it is possible that when a child learns the vocabulary of his native language, he integrates these words through a system of innate internal rules. Even four year old children use grammar rules without any difficulty despite not having ever learned these rules. It seems that they just know the rules. In the last few decades, Chomsky’s assessment has been verified again and again in many different scientific disciplines. The research of psycholinguist Steven Pinker has also proved that language skills are inborn. He has proven that all people speak language at a similar level of grammar complexity. Even people who remain isolated in the mountains of New Guinea for thousands of years, consistently and exactly use latent rules of grammar. The most impressive proof comes from natural experiments that showed how children were forced to apply grammar rules to a new language. The most famous case which was studied by Derek Bickerton involved a group of foreign workers that were brought to Hawaii in the nineteenth century from various places. These people developed a new language of their own which was a mixture of words and expressions from many sources and different languages. This language didn’t have consistent rules of grammar and it was very complex and wearisome, but this changed when the first generation of children learned the language. The language developed tenses (past-present-future and single-plural) and an orderly vocabulary and grammar like other existing languages, which turned it into a useful and effective language. Now it’s easier to understand the results of experiments made more than 700 years ago by Kaiser Frederick II, which were copied by the Scottish king James IV. They wanted to know what is man’s innate language. The story goes that they put two babies on an isolated island and had all their needs taken care of by a mute person. When the babies grew up, they began to speak by themselves — so it is told — and the language which they spoke was fluent Hebrew. It’s hard to believe such a story, but at least now we see it in a different light. As was proven, a child has an innate language instinct which he will develop into a complex language with grammar. If we go another step, we will see that Judaism claims that the universal language inherent to a person is the Holy Language (Biblical Hebrew) with which the world was created. In Genesis 2:23 it says, ”This one shall be called isha (a woman) because she was taken from ish (a man).” Rashi explains, “From here you see that the world was created in Hebrew.” Her name was given after contemplating her special abilities and the name given her expresses this. For example, the Talmud explains that a dog, the most faithful pet, was called kelev because it is kulo lev — “all heart.” The cat is the symbol of modesty, because after relieving itself, it covers its waste and hides it from everyone (hence it is called in Hebrew chatul — which means “covering”). A camel (in Hebrew, gamal) can for a long period of time “manage without” (l’higamal) its basic needs of food and drink. So it is for the rest of the animal names. The names of animals in other languages have no intrinsic meaning. In Hebrew, not only do the names of animals have intrinsic meaning, but everything else does too. Let´s take for example the human organs: eye (ayin) - comes from the word for a spring (maayan) (i.e. “And I came today to the spring,” Genesis 24:42). Visual abundance flows into man’s consciousness through the eye. The eye is also the source and fount of tears. Ear (ozen) is the organ that nourishes (zan) the soul because humans acquire understanding of the world around them through hearing, and a person’s center of balance (izune) and equilibrium is in the ear. The brain (moach) is the source of thought (machshava). The tongue (lashon) kneads (lashah) the food that enters the mouth, and “kneads” (shapes) the sound coming from the throat into speech. The hand (yad) has in its fingers 14 bones (all fingers have 3 bones besides the thumb which has 2 = 14). Fourteen in gematriya, the number value given to Hebrew letters, equals yad — the letters yud  anddaled . One cannot lift up a heavy package or do vigorous work unless he uses two hands (yad + yad in gematriya = koach, “strength”). Stretching out one’s hand to welcome another (yad + yad), spells the word “friend” (yadid). The world (olam) is derived from the word he’elem (concealed) because it conceals the spiritual world to enable free will for mankind. The soul (neshama), was inserted (hoosam) inside the body. The body (goof) — is a shade that blocks out the power of the soul like shutters keep the sun out (“lower the shutters” — lahagif trisim). So it is for all the other names given in Hebrew. Even the few words that do have meaning in other languages usually miss the essence of the object. 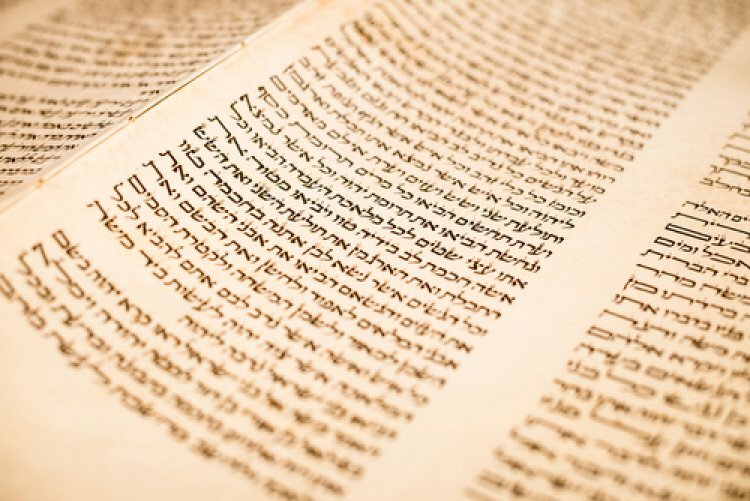 Rabbi Hirsch brings many examples of Hebrew’s intrinsic meaning of words in his commentary on the Torah. Besides this, we have a tradition passed down in the Torah from Adam to Metushelah to Noah to Eber that Hebrew was the original language. Since Eber retained Hebrew after the Generation of the Dispersal when the world was divided into different languages, therefore the language was called Hebrew after him (Ever = Ivrit = Hebrew). Abraham received Hebrew from his ancestor Eber). While living in Ur Chaldeans, Abraham spoke Aramaic because it was the language of the Chaldeans. However, he retained Hebrew as a special language, a “Holy Tongue” to be used for holy matters, and used Aramaic only for secular matters. Why are the 22 letters of Hebrew so holy? Because through them, G-d “legislated, probed, weighed, exchanged, joined together and brought down the soul of every living creature that He planned to create.” (Sefer Yetzira) On the phrase “G-d, Your word stands in the heavens for eternity,” the Baal Tanya explains that the letters which created the heaven and earth and everything in them forever infuse them with life and maintain them. “Were those letters to return to their source for even a second, G-d forbid, all heaven and all beings would revert to nothing.” (Shaar Yichud V’ha’emuna 1). “Anyone who profoundly knows the supreme spiritual forces latent in the letters and their various combinations and sequences and relationship with other things, can do amazing things including creating worlds,” says Pardes Rimonim by Rav Moshe Cordovero in the Gate of Letters. The word oht (which can mean “letter” or “miracle”) is mentioned 65 times in the Bible referring to a spiritual sign (“It is a sign forever”, “It is a sign between Me and you´´). Each letter reflects a spiritual power emanating from a heavenly source. Each letter reflects a spiritual matter camouflaged in physical attire. The letters of the Holy Tongue are unique in that each letter has several precise definitions of its symbolic meaning. 1. What is its numerical value (a = 1, b = 2). 2. What is its shape? (Why does an Aleph look the way it does and doesn’t look, for instance, like an A). 3. What is its pronunciation (Aleph = ah and Beit = bah). 4. What is its name? (Aleph, Beit, Gimmel, Daled, etc.). 5. What are the key words that it appears in (Aleph appears in Elokim (G-d). 6. What is the first place where it appears in the Torah (Raish first appears in ruach, spirit; Shin first appears in the word shomayim, heaven (Gen. 1:1). The following are some examples illustrating how this works. The significance of the letter Pei is creating a hole or taking something apart. For instance, pi habe’er is “the mouth of the well” and a person’s mouth (peh) is activated by separating the lips. The letter Tzadi implies strength (therefore hunting is tzayid). Pei and Tzadi together symbolize breaking down with force, so the root word Pei Tzadi Chet (פצח) means to crack, Pei Tzadi Hei (פצה) means to open one’s mouth despite resistance and Pei Tzadi Lamed (פצל) means to separate into two and Peh Tzadi Ayin (פצע) means to wound. When a root has two of the same letters, it implies intensity. Therefore, Pei Tzadi Tzadi (פצץ) means to blast to small pieces. Another example: the letter Raish represents spirit and perfection. Pei plus Raish mean to separate things which are connected and complete. Therefore the root Pei Raish Daled (פרד) means to separate, Pei Raish Hei (פרה) to propagate, i.e. to make many from one, Pei Raish Zayin (פרז) is an open and breached city without a wall, Pei Raish Tet (פרט) is to detail the components of a complete unit, and Pei Raish Chaf (פרך) is to take a mass and crumble it. Pei Raish Mem (פרם) is to undo a seam, Pei Raish Samech (פרס) is to diffuse something, Pei Raish Ayin (פרע) is to uncover a covered item, Pei Raish Tzadi (פרץ) is to cause a breach, Pei Raish Kuf (פרק) is to take apart, and Pei Raish Shin (פרש) is to spread apart or separate oneself. Pei Raish Shin can refer to unwinding a circular item or to an individual who leaves his society. Pei Raish Aleph (פרא) is a person who has thrown off all restraints. When a letter is used twice, it intensifies the meaning. Therefore, Pei Raish Raish (פרר) means to crumble into many crumbs. This idea applies to all the roots in the Holy Tongue. Many other examples can be found in the fascinating series of cassettes on the Holy Tongue by Rabbi Zvi Inbal, Rabbi Mordechai Neugroshel, Rabbi Ben Rinat and others. Rabbi Zadok Hakohen, in his Machshavot Charotz, explains that since the Holy Language is intrinsic and not merely consensual, we find that only in this language a root may express both a thing and its antonym. Therefore, the verb form of Kuf Lamed Samech (קלס) means to praise but the noun means disgrace. The noun of Chet Tet Aleph (חטא) means sin that pollutes the soul, but one of its verb forms means to disinfect and cleanse. The root word Samech Kuf Lamed can mean to throw stones (ֹלִסקוֹל), or to remove stones (לְסַקֵל), while the root word Shin Raish Shin can mean both to insert a plant in the ground (להשריש) or to uproot a plant (לשרש). The root word Beit Raish Aleph can mean to create (לברוא) or to eliminate (לברא). A thing might be familiar (ניכר) from root word Nun Chaf Raish, or it might be strange (מתנכר). You may be weak (חלש) from root word Chet Lamed Shin or you might have power over others (חולש). Gimmel Aleph Hei can mean a rising or inflation (גאה) or it can be a valley (גיא). Daled Lamed may be a downtrodden beggar (דל) or one drawing up water (לדלות). Raish Ayin can be evil (רַע) or a friend (ַַרֵע). Kuf Daled Shin is the root of holiness (קדושה) or a harlot (קדישה). The reason for this duality is because G-d has created opposing forces in the world. Because each letter indicates a quality, and by attaching letters one creates a word with a meaning that encompasses those qualities, we can understand why only in the Holy Tongue do we find many words whose letters are switched around but nevertheless mean the same. Forinstance, כבש-כשב (sheep), שמלה-שלמה (dress),בהלה-בלהה (fright), זוועה-זעווה (horror), יעף-עייף(tired), אנקה-נאקה (outcry), קהלה-להקה (organized group), ערק-עקר (abandoned), פורק-פוקר (a willful transgressor). The letter Aleph represents singularity. Beit represents plurality. The Maharal explains that the world was created from many kinds of items and therefore it was created with the letter Beit which symbolizes plurality. In contrast, the Revelation on Mt. Sinai where G-d revealed Himself to the world begins with the letter Aleph (“I am G-d” - Anochi Hashem) because plurality doesn’t exist in God (Midrash Rabbah). The word av (father) comes from the root Aleph Beth which represents an individual (Aleph) who has turned into a multitude (Beth) by begetting children. The word ben(son) from Beth Nun symbolizes multiplicity and continuity (the letter Nun represents continuity — the words for stream, river, flowing, and forever all begin with a Nun). The son is a continuation of the father and so is the grandson (nehched) and greatgrandson (nin). The letter Beth (which has a numerical value of 2) symbolizes plurality of a unit, while Chaf (whose numerical value is 20) symbolizes the plurality of tens, and Raish (value of 200) symbolizes the plurality of hundreds. Together they form the root word Beth Chaf Raish (bechor) which spells “firstborn”. The firstborn turns his father from an individual to a multitude. The firstborn also takes a double inheritance, which is hinted at in the very word describing him (which is constructed from the 3 letters which are forms of “double.“ (2-20-200). The letter Aleph first appears in the Torah in the name of God (Elokim), and therefore its numerical value is one, which shows G-d’s unity. If we add the letters which form the name of the word Aleph, we have Aleph Lamed Pei whose numerical value is 111 (80 +30 +1) — three ones. The shape of the letter Aleph as it appears in a Torah scroll is a diagonal Vov, with one Yud above and one Yud below, which numerically amounts to 26 (6 +10 +10). This equals the numerical value of G-d’s Name Yud Hei Vov Hei. Again we see how the Aleph symbolizes G-d.
Why is the first letter’s name Aleph (Aleph Lamed Pei) and not “Ai” (like in English)? The Vilna Gaon (in the Likutim at the end of Zeraim) reveals an wonderful reason why: the Aleph hints to all the letters, since Aleph is at the beginning of the alphabet, Lamed is right in the middle, and Pei is close to the end.